Each kit contains RNAGEM, DNase I, BLUE buffer, 10x DNase buffer, and 10x TE. Ideal for mammalian cell culture, laser capture micro-dissections and FACS-prepared cell populations such as macrophages. RNAGEM is a whole nucleic acid extraction kit providing an extremely simple method to extract RNA from a single cell to 100,000 cells. The kit includes RNase-free enzymes, buffers, and DNase I. It enables temperature-controlled rapid preparation of RNA from mammalian cell culture, laser capture micro-dissections and FACS-prepared cell populations, such as macrophages. Extraction of RNA is well-known to be a difficult process due to the low stability of the RNA molecules and the abundance of RNases. 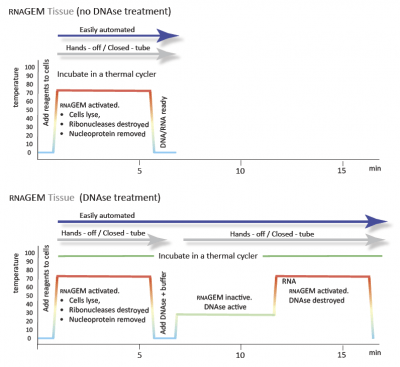 MicroGEM’s RNAGEM solves this with extremely fast, temperature-controlled RNA extractions that simultaneously lyses cells and eliminates RNases. The RNAGEM kit is highly adaptable to a range of extraction volumes and can be scaled depending on cell count. After extraction, an optional DNase treatment is included to enrich for RNA. The RNA is immediately ready for downstream applications, such as RT-PCR and RT-qPCR. These reagents can be added directly to the RNA sample for a simple, streamlined 96-well plate protocol. RNAGEM is optimized to work with a number of different culture types, including cells in suspension, adherent cells, cells stored in RNAlater™, cell pellets, and FACS and LCM. The RNAGEM kit allows for total nucleic acid extraction or just extraction of RNA depending on your needs. The protocol for co-purification of RNA and DNA is rapid, going from sample to nucleic acids in 5 mins. RNA alone can be purified with the addition of DNase (supplied with the kit), which adds another 10 minutes to the protocol. The figure summarizes co-purification and RNA extraction workflows. RNAGEM is compatible with polymerases and reverse-transcriptases and the extracts can be used without purification in PCR, RT-PCR, qPCR and RT-qPCR. This leads to far greater sensitivity and linearity across a broad range of cell numbers. 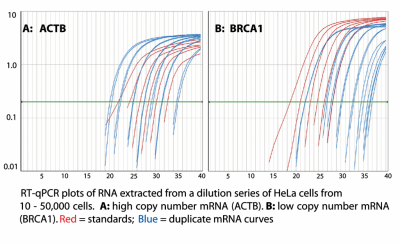 The plots here were obtained when 5 µl of RNAGEM extracts from HeLa cells were added directly to an RT-qPCR. 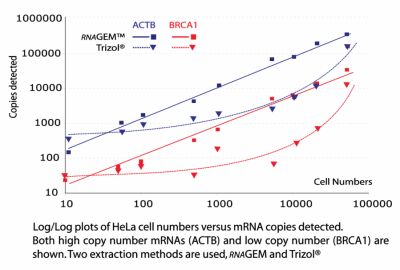 Cell numbers ranging from 10 – 50,000 were RNAGEM-extracted and plots generated from a high abundance mRNA (ACTB; ß-actin) and a low abundance mRNA (BRCA1; breast cancer early onset). The clean traces with gradients similar to the standards demonstrate the lack of inhibition and the plots obtained from as few as 10 cells demonstrate the sensitivity of the method. Using the recommended method, the efficiency of RNAGEM extraction is constant over the range of 1 to approximately 100,000 cells and gives excellent yields (see below). In contrast, TRIzol® extraction loses the mRNA from low abundance cells. This means that sample normalisation can be obtained with a simple qPCR of gDNA in non-DNase-treated extract. Different ranges of linearity can be obtained by small modifications to the base procedure as shown here.